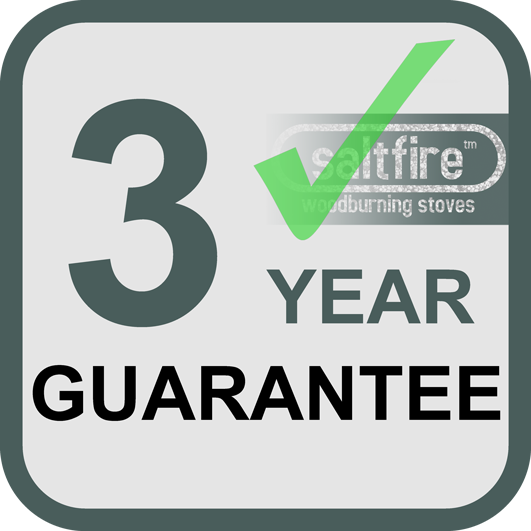 All Saltfire Stoves are guaranteed to be free of manufacturing defects for a period of 3 Years from date of purchase. (Ekol stoves have an extended 5 Year Guarantee which must be registered on the Ekol website). This does not include consumable items such as glass, grates, inner lining plates/fire-bricks, baffle plates, door seals, paint, over-firing, incorrect use or installation not carried out by a competent person or in accordance with building regulations. The guarantee covers the stove body. If an item is faulty, we must be informed of your intention to return and will give instructions for the return of the item. It must be complete with all its component parts. It must not have been altered or modified in any way. The customer is responsible for ensuring the item arrives back to us in sound condition. Products manufactured by other brands will be covered by the respective manufacturers guarantees. We will refund or credit/replace most unwanted items within 14 days of receipt. We will refund or credit/replace unwanted items within 14 days of receipt. Flexible flue liner cannot be refunded under any circumstances. We must be informed beforehand of your intention to return. Returned goods must be returned unused and in original packaging. Items cut to order, or bespoke items such as painted to order etc. cannot be refunded. The customer is responsible for returning items to us.